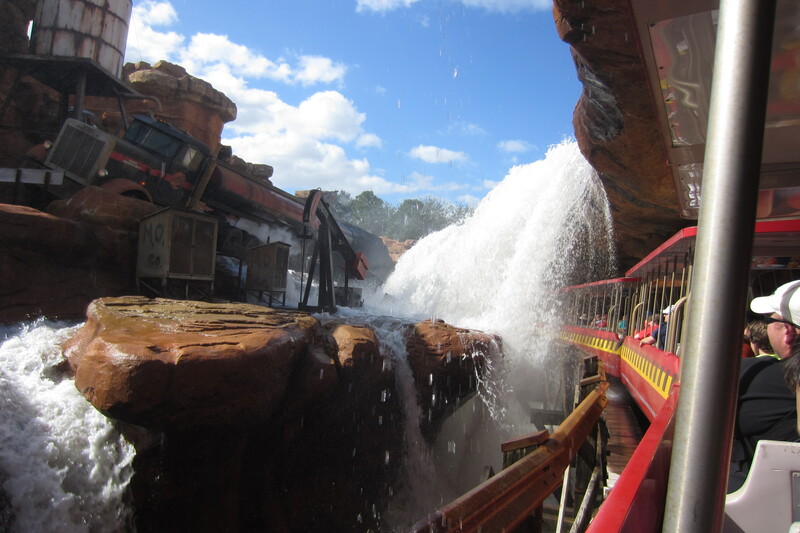 When you live in Florida, it’s easy to fall into the Disney Doldrums. 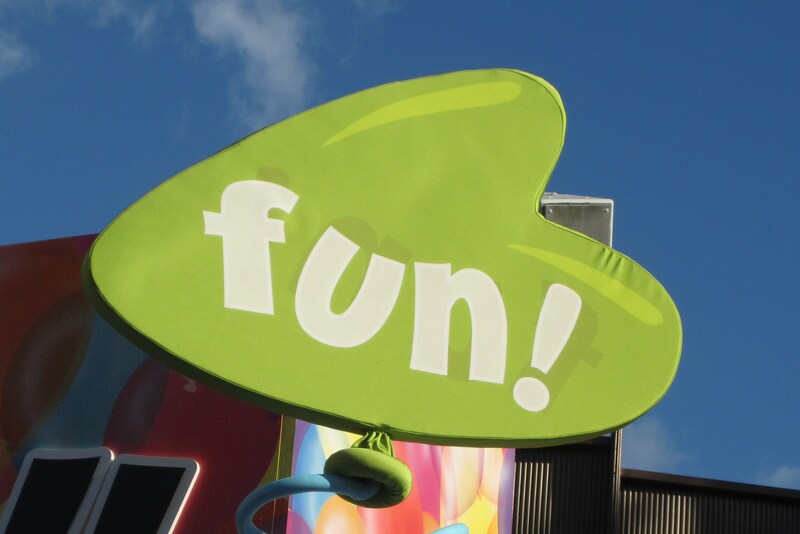 The Disney Doldrums is when you go to Disney World Resorts and do the same things and go to the same places each time. This year, we decided to be different and have a weekend of Firsts! 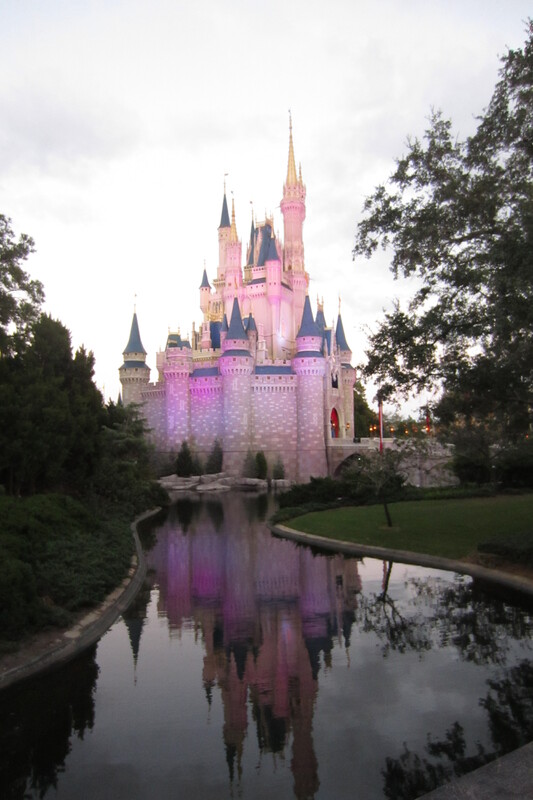 My husband is not a theme park fan, so I’m glad my daughter, Becky, loves the magic of Disney more than I do. We had never been to Disney as Christmastime so this year, we decided it would be our first Disney Christmas. 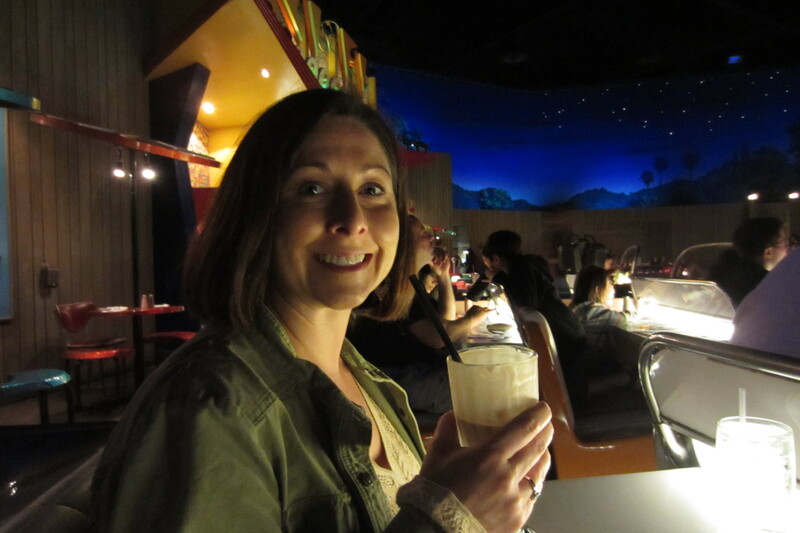 Hollywood Studios Sci-Fi Drive In — The Sci-Fi Drive in brings back memories of watching B Movies such as “The Attack of the Fifty-Foot Woman.” Sit in booths designed as vintage cars under a night-time sky, have a milk shake, burger and fries. It was great and the burgers were really good. A funny aside – my daughter and I are not tall people – bordering on vertically challenged. We were sitting in the back of the restaurant in the very back seat of the very last car. The hostess seated the tallest couple I’ve ever seen in front of us. They must have played basketball or volleyball. I wish I had a picture of Becky and me leaning out either side of the car so that we could see the movies. REMINDER: get a reservation or go for an early lunch about 11:00 to 11:15. 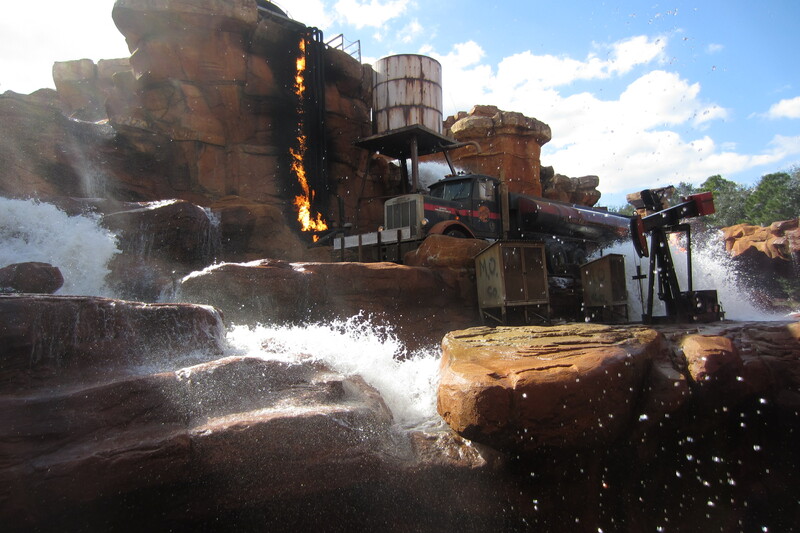 Hollywood Studies Backlot Tour – The Backlot Tour is a behind the scenes tour of movie special effects including pyrotechnics and water works. The tram ride was comfortable and it was really cool to see familiar movie props as well as how they do the special effects. Grand Floridian Lobby – We took the boat launch from the Magic Kingdom to the Grand Floridian, Disney’s Victorian hotel and resort. The hotel’s five-story lobby was decorated with a giant tree that went almost to the ceiling. 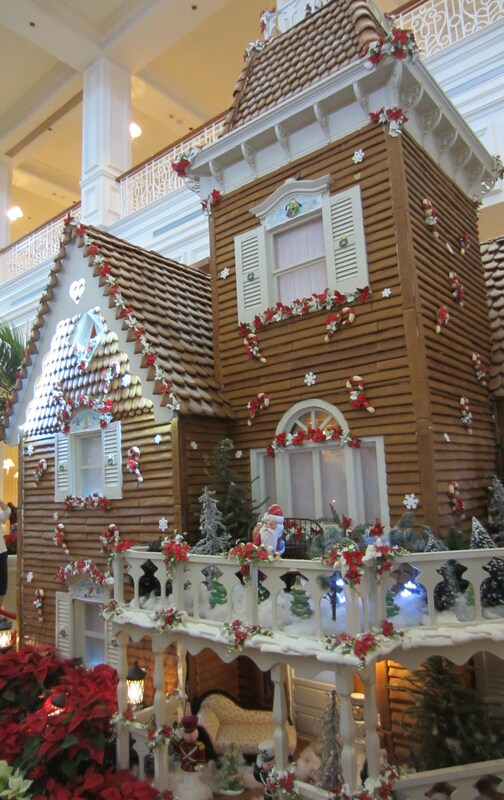 Just inside is a completely decorated life-size Gingerbread house. A woman was giving an informative demonstration on how to create and decorate your own gingerbread house. The dining room was in the process of being set up for high tea – maybe attending high tea will be a first for another trip. Be sure to check out the shops open on the upper levels. Catch the monorail on the second level to go back to the Magic Kingdom or the Transportation Center to catch the monorail to Epcot. 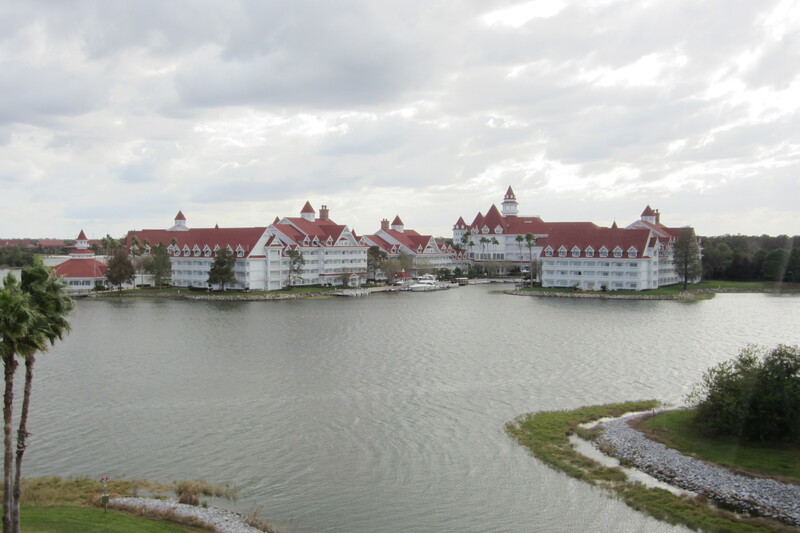 As you leave the Grand Floridian look back, enjoy the view and imagine the luxury of a Victorian lifestyle in old Florida. 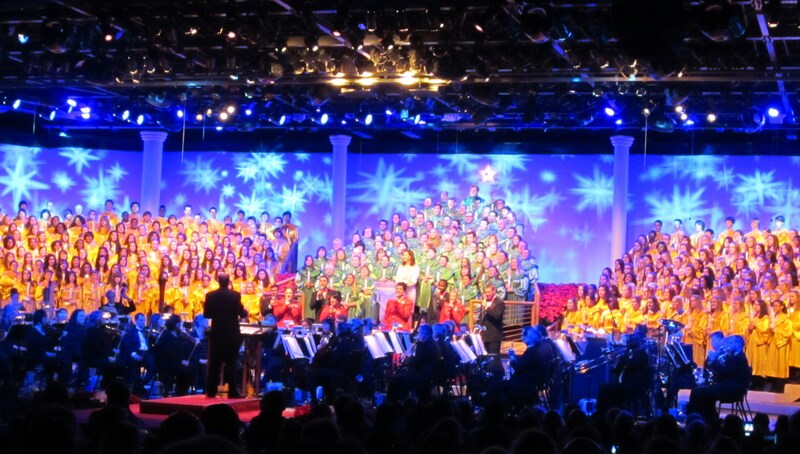 Epcot Candlelight Processional: The highlight of the weekend was the Epcot Christmas Candlelight Processional. We purchased the dinner package that included dinner, VIP seating for the processional and the fireworks. 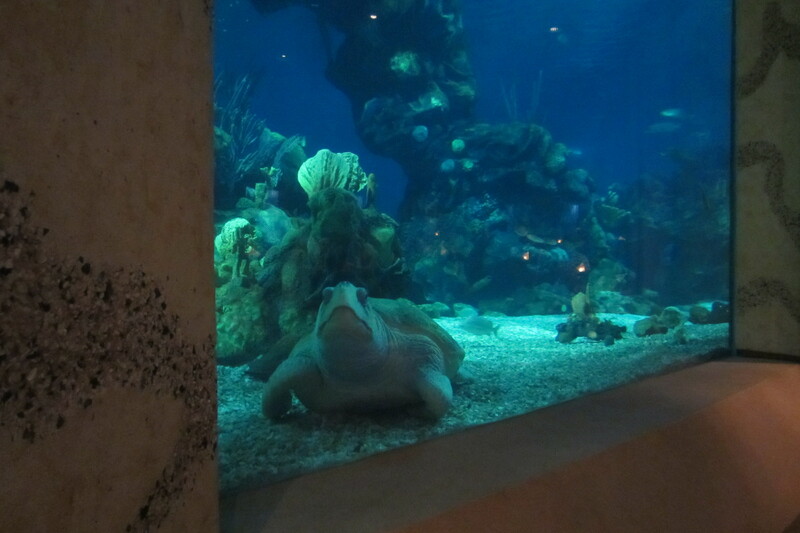 We ate at the Coral Reef at the Living Seas exhibit. We enjoyed the irony of eating seafood as the sharks, fish, and sea turtles swam by us enjoying the well prepared fare. The package includes appetizer, entrée, dessert and non-alcoholic drink. The mussels appetizer was good as were the crab cakes. We both had the lobster ravioli which had generous clumps of lobster and shrimp in a delicate cream sauce. For dessert we split the vanilla crème brulee which was excellent and the Jack Daniels and Bailey’s mousse which was very good but heavier than I expected. The service was good and the staff was friendly. HINT: Check the bill carefully – with a lot of specials, packages, and dining plans, it is easy for a busy server to get confused. 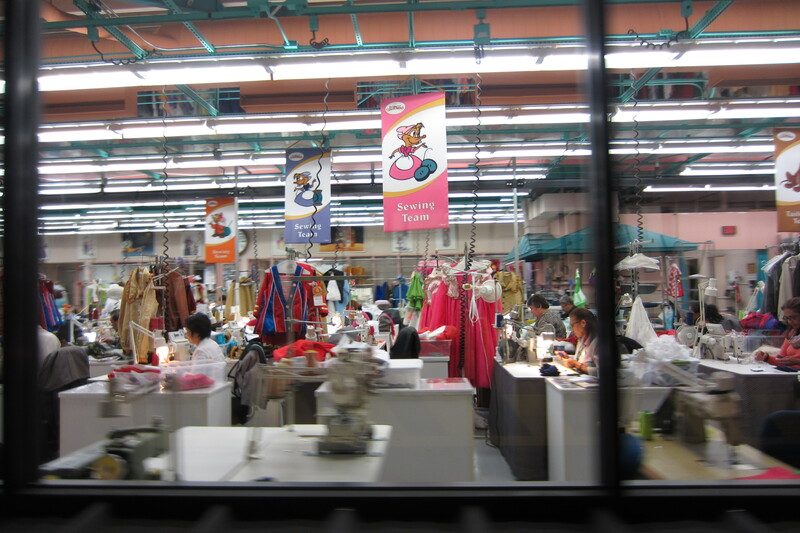 It’s not their fault – just be aware of what is in your particular package. 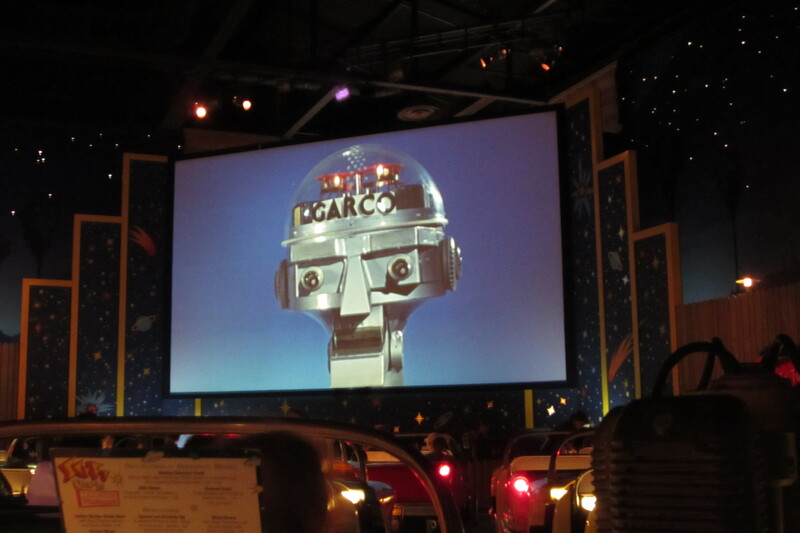 The night we attended, Geena Davis was the narrator. The orchestra and choirs were well-arranged and directed. All green, gold, red, and there was Geena in a figure forming white dress. The sign language interpreter moved with the grace of an expressive dancer. The beauty of the music and the classic Christmas story brought a tear or two. It was extremely special to see Geena Davis narrate the Christmas story as I have a connection with her. I was the team manager for the U.S. Archery Team for the 2000 Olympic Games. Geena qualified to try out for the Olympic Games that year. I met her during the 1999 Test Tournament in Sydney. She is a wonderful person and I was so happy to be there to see her narration of the Christmas Story. The fireworks were a perfect ending to the perfect Disney Christmas at Epcot. 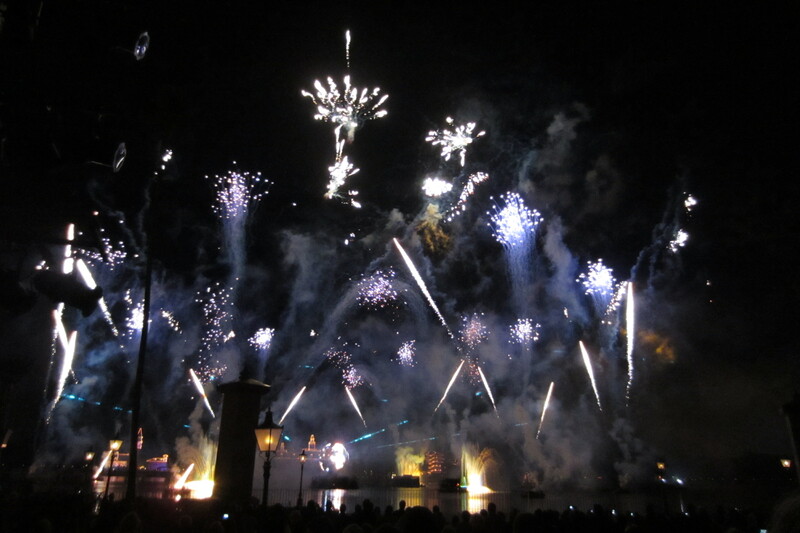 The Epcot fireworks are my favorite presentation at DisneyWorld. The VIP seating is definitely the way to go. So much for our weekend of firsts at Disney. We missed the Osbornes Christmas lights at Hollywood Studios. We just didn’t have enough evening hours to hit everything. That will be a first for another year. On Sunday we took a rest from the parks and scheduled the holiday spa special at the hotel before heading home. What a great way to end the weekend of Disney Firsts! 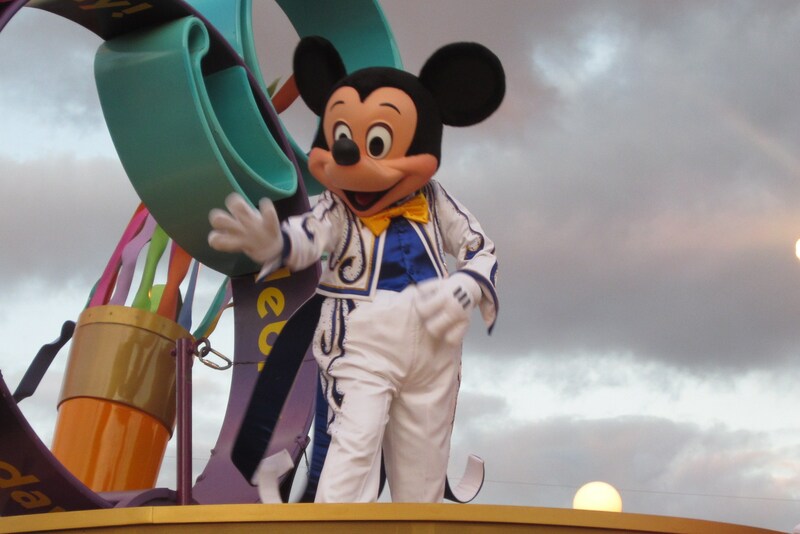 This entry was posted in Florida, Locations and tagged Coral Reef Restaurant, DisneyWorld, Epcot, Epcot Candlelight Processional, Geena Davis, Grand Floridian. Bookmark the permalink. Thank you Eryn. I’m glad you enjoyed the post. 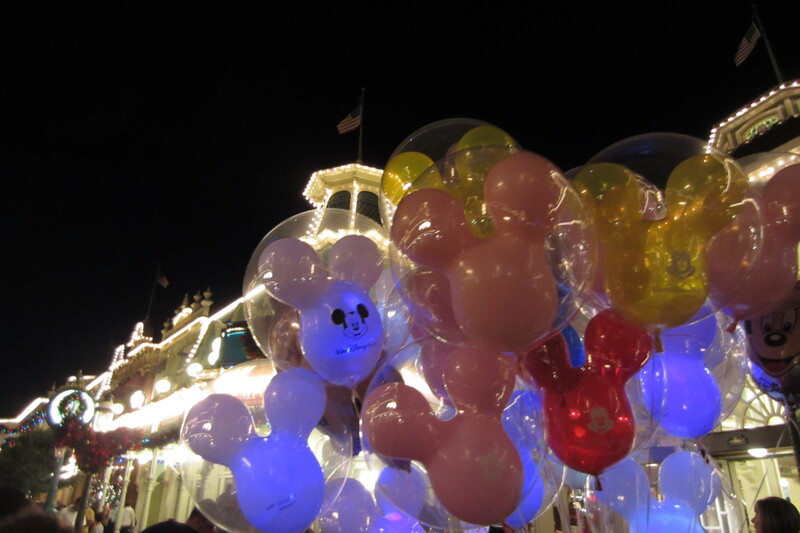 It was a wonderful Disney weekend.